Dementia is increasingly becoming more widespread than ever. According to statistics, there are a staggering fifty million people suffering from this condition. Every year, another ten million new cases of dementia are diagnosed. Dementia takes different forms, varying in their severity. However most of the symptoms are common to different types of dementia, and in each case, the patient will experience difficulties in his or her mental abilities. The severity of dementia symptoms will depend on the particular stage that the condition is affecting the patient. First, one will start to forget things. Forgetfulness will eventually become more severe and lead to losing jobs or even forgetting what one wanted to say just before trying to utter it. Some more severe dementia symptoms include getting lost and not knowing how to go back, misplacing things and forgetting what happened even though it was only a short while before. Dementia patients have trouble when they try to organize their thoughts and so they often feel confused. As the dementia stage progresses, there are even problems in trying to remember what loved ones are called, or who they are. Communication skills start to decrease, and it is often to note that people who have dementia tend to repeat the same things over and over again without being aware that they are doing so. At times there are also changes in behavior. Considering all of these symptoms, one certainly agrees that this medical condition can prove to be very serious. Proper care and treatment are required to reduce the symptoms as much as possible, as well as safeguard the safety of the patient. Dementia can indeed end up being a life-threatening problem, especially if it is left untreated. CBD, which is short for Cannabidiol, is a compound that is derived from Cannabis. This compound is thus natural since Cannabis is ultimately a plant. Even though some consider it as a drug, Cannabis is legal in 46 states in America. Cannabis has various favorable medicinal properties, and it should not be confused with drugs such as marijuana or THC. CBD oil is the most common form you will find it in. From various studies, it has been concluded that CBD can prove to be beneficial for diseases such as Parkinson’s disease, Alzheimer’s disease, and Huntington’s disease, among others. There are several different dementia-related conditions which can be improved thanks to CBD. These include Vascular Dementia, Frontotemporal Dementia, and Dementia with Lewy Bodies. Using CBD for dementia is a form of treatment that is quickly becoming more popular than ever. CBD oil has been scientifically proven to prevent dementia from developing, thanks to its anti-oxidative and neuroprotective properties. Moreover, CBD has been described by researchers as helping protect synaptic plasticity, and in preventing memory deficits. CBD has been scientifically proven to help in removing dementia from the brain cells. It also helps in reducing inflammations by significantly reducing any oxygen build-ups. It can offer significant neuroprotection and also work as a brain stimulant. Another benefit of CBD is that it can help in reducing anxiety and stress. This, in turn, supports the improved health of brain functions as well as memory. Hemp oil is similar to CBD oil. The main difference lies in the part of the plant that they are derived from. Hemp oil is derived from the seeds, whereas CBD oils come from the leaves and the flowers of the plant. Both can prove to be highly beneficial, and both are used for the treatment of dementia as well as other diseases. However, hemp oil is more generally used in lotions and soaps. It also acts well as a protein supplement. Hemp oil is typically taken from the industrial hemp plants. Hemp oil has a nut-like , and it is often used in cooking. It is often referred to as a superfood because it is very high in vitamins, nutrients, and omegas. 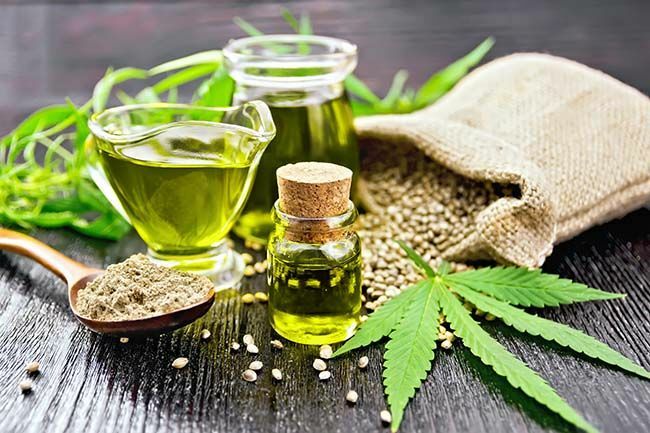 What many people do not know is that hemp oil comprises minimal amounts of THC, that is the chemical that is found in the marijuana plant, which is mainly attributed to getting high. Thus it is non-psychoactive. Also, hemp oil does not contain CBD. Hemp oil is mainly used to control stress and assist with pain. It is not to be confused with CBD oil, as the latter is the best option when it comes to the treatment of dementia, and the reduction of its various symptoms. Vascular dementia is mainly associated with problems relating to memory. A patient who suffers from this form of dementia will experience problems such as memory loss, poor judgment and reasoning, and an inability to plan appropriately. These processes are impaired because of the disease. In a study carried out by the NIH in 2016, to test the effectiveness of CBD for Vascular Dementia treatment, it was found that cannabinoid receptors in the brain were able to recover a better blood flow towards the brain. This led to increased and improved brain cell activity. LBD is another form of dementia whereby there are abnormal protein deposits in the brain. These are Lewy bodies, which have an adverse effect on the chemicals in the brain. This, in turn, causes problems associated with behavior, moods, thinking, and sleeping, among others. Treating this disease with CBD is beneficial since the CBD can act as an effective anti-inflammatory agent. Problems such as tremors, rigidity and poor sleep rhythms can thus be resolved and treated well. FTD involves the degeneration of nerve cells. These are found in the frontal lobes of the brain. These lead to problems such as depression and psychosis. According to research, CBD can be a very useful anti-inflammatory agent in these cases. It can also help to reduce negative motor symptoms and anxiety. Fast-acting CBD oil tinctures taken daily prove to help counteract the symptoms of dementia. The CBD oil should be taken sublingually by putting some drops beneath one’s tongue. The dosage varies according to the individual and the stage of dementia. This treatment is the most fast-acting. There are also CBD pills, which can offer relief for a number of hours. The main drawback of pills and capsules is that they will need some time before they start to act, unlike CBD oil tinctures which are much more fast-acting. Another way to take CBD is by vaporizing the oil. This is an ideal treatment method when a patient experiences flare-ups of dementia symptoms. CBD oil can also be used in cooking for more prolonged symptom relief. CBD can offer some protection against dementia, as thanks to its unique properties it can reduce the chances of getting diagnosed with it. Although prevention is better than cure, CBD oil can also be used by people who already suffer from dementia. It can help to avoid the disease from getting more severe and the symptoms from worsening further. – Unlike what some people may say, CBD is not a drug. On the contrary, it is very helpful from a medicinal point of view if used well. – CBD is not a sedative, and it does not reduce one’s alertness. On the contrary, it helps in proper sleeping patterns. – The psychoactive effects of CBD are not negative ones as they can help. Considering all of these benefits that CBD has, it can indeed prove to be an effective treatment for various kinds of dementia. There have been various studies to back up the medicinal benefits of CBD, and they have all concluded that CBD can indeed be very helpful in treating dementia, as well as help in preventing it. For patients who suffer from dementia, regardless of the type and stage the disease is in, the symptoms can prove to be very degrading on various levels. The proper treatment for the disease and the possibility of reducing the various negative symptoms associated with it is thus extremely important. A person’s life, as well as his or her dignity is at stake here, and there are also various effects on that person’s loved ones too. CBD oil has been proven to be effective medicinally, but side effects can still occur when one does not use it properly. These include drowsiness, nausea, changes in mood and appetite, diarrhea, and dizziness. In conclusion, CBD can prove to be very helpful in the treatment of dementia. The most important thing is that it is taken in the right dosage and that medical advice is always sought so as to ensure that the best use is made from it and that it is being administered in an ideal manner. This entry was posted in CBD Science and tagged CAN CBD HELP WITH DEMENTIA, CBD for Dementia, HEMP OIL FOR DEMENTIA.